Free Shipping Included! QQCute True Wireless Earbuds Bluetooth 4.1 Headphones Hands Free Call In-Ear Sport Earphones Headset with Charging Case, Built-in Microphone by QQCute at Got Busted Mobile. MPN: erji-new. Hurry! Limited time offer. Offer valid only while supplies last. 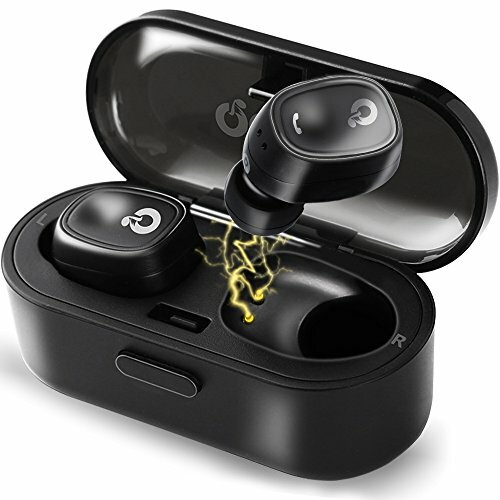 [WHAT YOU GET AND WARRANTY] 1*Pair of true wireless earbuds, 1*magnetic charging case, 1*USB charging line, 3*ear tips ( S, M, L ), 1*user's manual. QQCute provides one year warranty and satisfying customer services for long time. [PORTABLE POWERFUL CHARGING CASE] Wireless earbuds can last 2-2.5 hours for music playtime after fully charged. Beside, The charging box with 300mAH can charge the earphone two or three times. It is so convenient for customer to go outside with this charging case. You don't have to worry about your headphones running out. [ONE-STEP PARING TECHNOLOGY] Take both headphones out of charging case at the same time, and they will automatically connect. Then you can connect the headset to the phone via blue-tooth. It is unlike traditional wired earphones that you need to press the button to turn on the earphone and then connect to your phone's blue-tooth. [PREMIUM SOUND QUALITY] Featuring Bluetooth 4.1 and real wireless stereo produce incredible sound quality with clear booming bass. QQCute true wireless earbuds can block out a lot of surrounding noises, and do avoid noise created during running, biking, jogging or working. [PERONALIZE YOUR FIT] There are three size (S,M,L) of ear tips to choose. It is lightweight, removable, soft and comfortable to wear. Flexible design ensure the headphones fits for everyone, and remains comfortable even during prolonged periods of use. If you have any questions about this product by QQCute, contact us by completing and submitting the form below. If you are looking for a specif part number, please include it with your message.